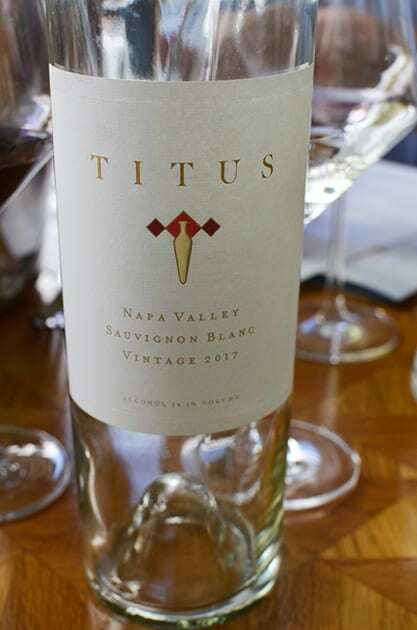 Celebrating fifty years of growing grapes in Napa Valley, Titus Vineyards shows us that a family’s determination to hold on to the land they purchased in 1968 and still sustain the quality of wine that Napa is known for can prevail. Today in Napa we see many wineries selling out to the big conglomerates. It is refreshing to find those wineries that continue to keep wine growing traditions from generation to generation; similar to what you see in Europe especially Italy, Spain, and France. It is a testament to this Napa vineyard. As I sipped the Titus wine, one word crossed my mind, balance. The balance perceived in the wine is the same balance that has sustained this family owned vineyard for 50 years. Balance achieved through farming, the winemaking process and ultimately in each bottle of wine. Titus Vineyards is a 50-acre vineyard located at the base of Howell Mountain on the Silverado Trail in the St. Helena AVA. The legacy of the vineyards dates back to 1841 when Dr. Edward Bale received a land grant of 18 acres. Throughout the years the land passed to the likes of Charles Krug and Eli York. In 1968 Dr. Lee Titus, a Sonoma radiologist and his wife Ruth purchased the property. The Titus’ first harvest occurred in 1969 well before both Napa Valley and St. Helena became AVAs. 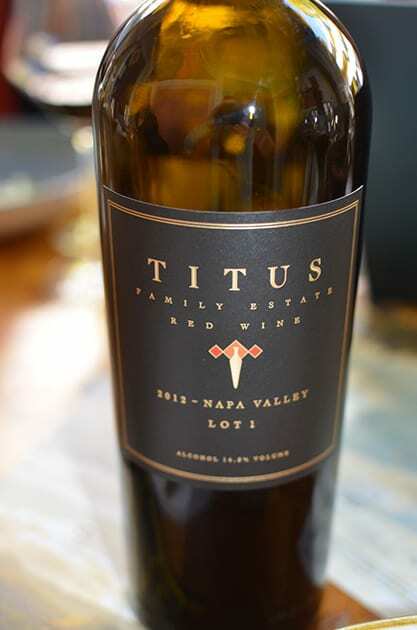 Until 1990 Titus sold their grapes to various Napa wineries including Beaulieu and Cuvaison. In 1990 Titus produced their first vintage. By 2015 they open their winery. Today, brothers Eric and Phillip Titus oversee both the farming and production of the winery. Phillip also works as winemaker at Chappellet Winery. Both vineyards lie on the banks of the Napa River. The Titus Estate Vineyards consists of 42 acres lying between the Napa River and the base of Howell Mountain. This vineyard feature sandy well-drained alluvial soils. 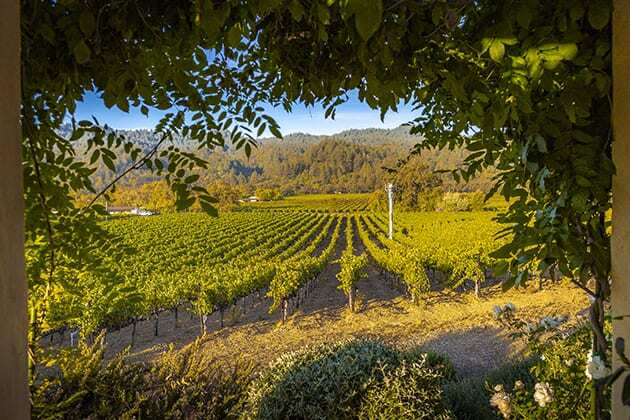 The Ehlers Estate Vineyard, a 10-acre property lies between the Napa River and the hills of Spring Mountain and consists of rocky volcanic soils. The vineyards are planted with Bordeaux varieties including Cabernet Sauvignon, Cabernet Franc, Petit Verdot, and Sauvignon Blanc. Other varieties planted include Petit Sirah and Zinfandel. Titus Vineyards Windmill. 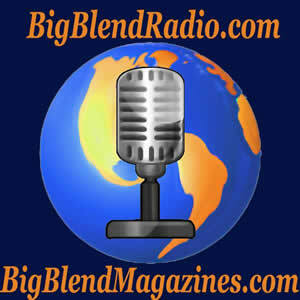 Photo Courtesy of Frank Gutierrez. 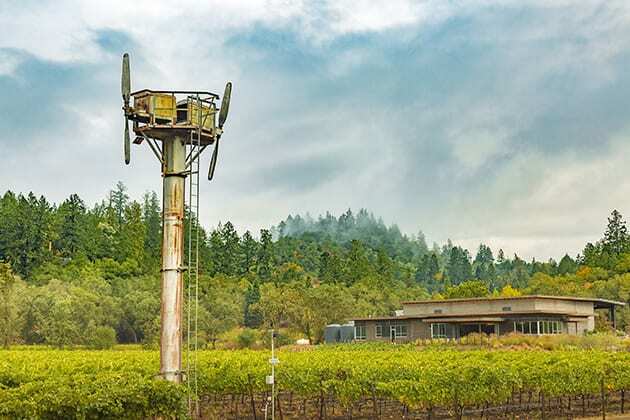 Signaling the heritage of the Titus Vineyards are the windmill that stands as a beckon drawing you to the property. 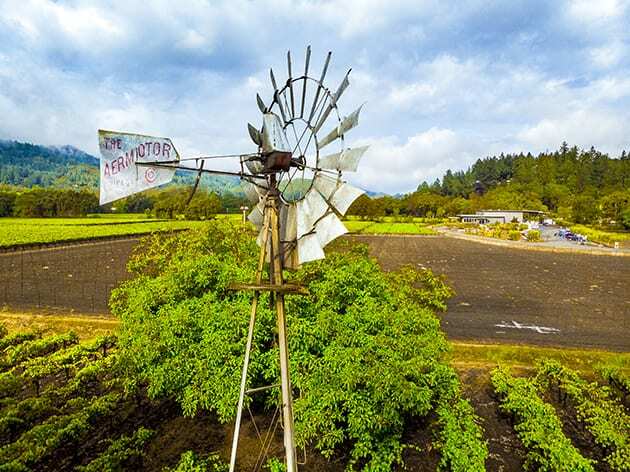 As you observe the vista of the vineyards, you will see a tall rusty fan, which was the first frost fan in the Napa Valley. It dates back to 1951. The fan signifies the care that was taken to protect the vines. It also represents the shift from the use of smudge pots to the fan. For the 1950s it demonstrated that wineries were already thinking about the carbon footprint and were paving the way to change to green practices since the smudge pots polluted the air. The windmill on the property maybe 100 years old and portrays the vineyards heritage to the grapes that grew there in the past. Titus Vineyards Fan and winery. Photo courtesy of Frank Gutierrez. Recently, I met Eric Titus while he was visiting Los Angeles. Eric came into the family business in 1997. As a child, he had worked in the vineyards, but before entering the wine business, he pursued a career in Marine biology after receiving a doctorate in biology. Today he is the general manager and vineyard operations manager. Under his helm, Eric utilizes some of his applied science and environmental aspects of his background to the vineyard practices. These include sustainable farming, dry farming, having a light human footprint in the vineyard with most activity being done by hand. This philosophy allows the grapes to express themselves. With brother Phillip and winemaker Stephen Cruzan, the goal is to produce wine that shows off the unique qualities and characteristics of each lot and block of the Titus Vineyards. 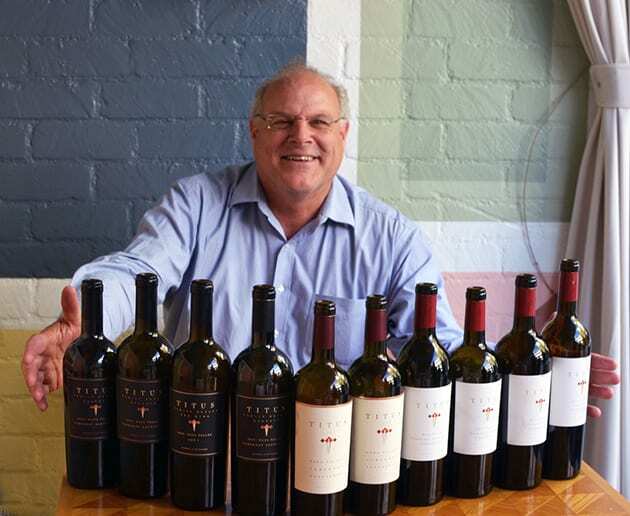 With their prowess, they bring out the overall balance that is prevalent throughout the Titus portfolio of wines. 2017 Sauvignon Blanc: I found a soft, appealing Sauvignon Blanc with flavors of apple and florals. The grapes come from a portion of the vineyard that has a warmer climate. The addition of a tiny percentage of Viognier integrates the wine making it a stand out for this variety. 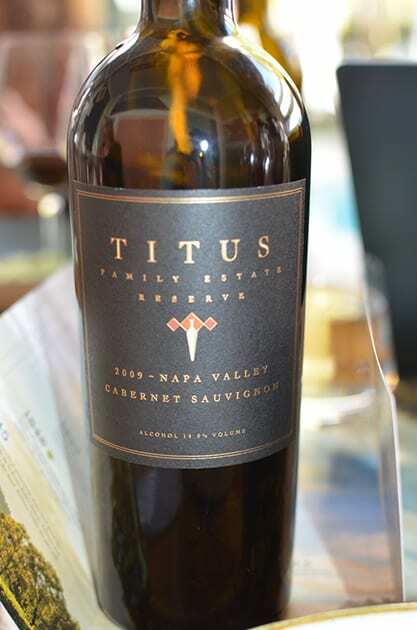 The Family Estate Reserve Cabernet Sauvignon is considered Titus’ flagship wine. This Cabernet with small portions of Petit Verdot and Malbec feature the best fruit from the Ehlers Lane Vineyard. I found cherry on the nose and both cherry and blackberry flavors on the palate with hints of chocolate on the finish. The wine ages in 55% new oak, a blend of 50% Hungarian, 40% French and 10% American. Andronicus represents Titus’ introductory level wine. Shakespeare used the name as the title of the play “Titus Andronicus,” thus making this name apropos for the Tutus entry-level wine. In Greek, the word means the victory of man. For Titus Vineyards it is the victory of the men behind the wine. This Bordeaux blend consists of Cabernet Sauvignon. Malbec, Cabernet Franc, Petit Verdot, and Merlot. On the palate, I found dark fruits and green pepper. 2016 Titus Cabernet Sauvignon Napa Valley. I found this Cabernet more austere yet bright and balanced with flavors of cherry, pomegranate, mocha, and leather. This wine ages in new oak, 55% French, 40% Hungarian and 10% American. 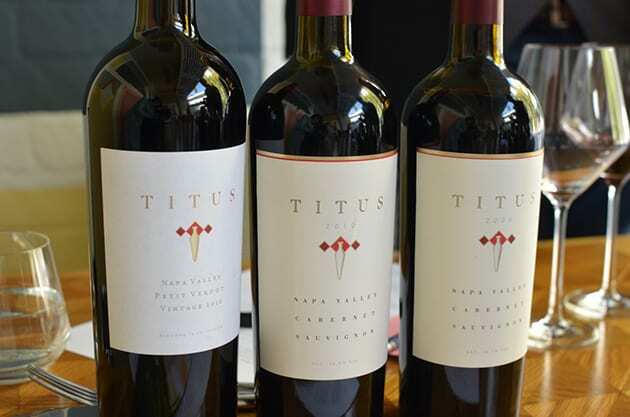 2010 Titus Cabernet Sauvignon although older displayed many of the qualities of the 2016 with the most significant difference being the wine contains 100% Cabernet Sauvignon. 2006 Cabernet Sauvignon displays a veggie quality on the nose, but on the palate, I found a well-blended fresh wine with distinct flavors of cherry. This Cabernet Sauvignon was my favorite at the tasting. 2009 Cabernet Sauvignon reserve featured veggie aromas, yet the wine exhibited itself as fresh and together. 2010 Cabernet Sauvignon Reserve displayed softer aromas and dark fruit on the palate. 2016 Cabernet Franc exhibited flavors of Raspberries. I found a wine that is lighter than most Cabernet Francs. On the nose, I found perfumes of florals. I rather liked the lightness of this wine. 2016 Zinfandel is composed of 40-year old vines that are placed on St. George rootstock and dry farmed. I discovered a soft very balanced Zinfandel with flavors of cherry accented by pepper. 2012 Titus Red Wine Lot 1 is the proprietary blend composed of Malbec Petit Verdot, Petite Sirah, and Zinfandel. The wine offers a big structure and flavors as dark fruit prevails. Finally, we ended our meal with the 2012 Petit Verdot, which left us with an understanding of strides the Titus family accomplished over fifty years as Napa vineyard grape growers to becoming winemakers and beyond. Here’s to another fifty years of outstanding wine. Feature photo courtesy of Frank Gutierrez.